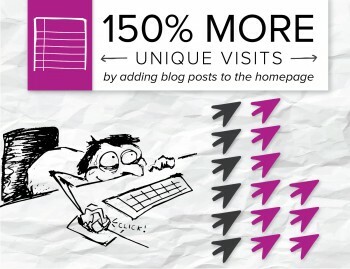 Want to know how to get 150 percent more unique visits to your content? The content you have on your website will only be successful if people see it, so you need to put it front and center online. One company we work with decided it wanted more traffic enough to justify giving up precious real estate on its homepage to host recent blog headlines – and it paid off big time. Within a business quarter, the site was getting 156 percent more unique views to its web content. And all it took was a couple small changes: Add featured images to blog posts and put headlines on the homepage. We’ve seen this work for other companies too, which is why we are strong proponents of displaying headlines on the homepage and using complementary visuals. It places the most recent updates in plain view of anyone who comes to your website. When they see them, visitors can actually click and review your full resource archive, giving you more unique visits. Think about the way most people read the newspaper (or used to read the newspaper). They usually review the headlines on the front page, and then continue reading stories deeper in the piece. It’s less common to jump to the middle of a section to see what might be there. It makes it easy for search crawlers to see your most recent posts right away, so they can index the content and serve it to users looking for relevant information. The homepage links also create a clear pathway back to the blog section, so crawlers can see all the other fresh assets there. If the content were hidden away on a remote part of your website, it would take search bots longer to find it, and you could miss out on valuable opportunities to answer searchers’ questions. Check out this piece for more details about ‘content integration’ best practices, and the results these basic practices provide. The act of adding visuals to your blog posts has a noticeable impact. We’ve seen that when brands add images (even if they’re stock photos) to their posts, their content gets 35 percent more pageviews than it did without them. Keep in mind: Like all things digital marketing, customization counts. Viewers are rewarding brands that take the time to create personalized images with more social shares. Here’s a study that found posts with infographics or hand-drawn images outperform stock photos twofold or more. We’re living in an information age, and people want to have an instant understanding about what a company does and why it’s different from others on the web when they visit the website. If you lead with custom content, you show visitors why you’re the go-to source for insights and give them a reason to spend more time looking into your brand.